If you are what you consume, then Seattle’s TV viewing habits are totally in sync with its reputation as a well-educated and high-tech mecca. According to the most recent Nielsen Scarborough Research Study, Seattle-Tacoma ranks first among the top 15 markets in the nation for propensity to typically watch Documentaries and second for viewing Sci-fi programming. It also ranks in the top 10 for tendency to seek out Mystery/Suspense/Crime shows (3rd), Dramas (4th), Sports (5th), Reality-Talent shows (7th), Reality-Adventure shows (8th) and Comedies (8th). Our viewing and content preferences are a telling differentiator when compared to other markets. Within the Seattle-Tacoma market, documentaries only rank 3rd among total viewers who typically seek out programming, and Science Fiction ranks 8th. The national ranking is based on the percentage of the market that typically views this programming, and we simply like these formats more. Documentaries seems a no-brainer for this liberal and highly educated core market. The correlation of sci-fi fandom with our techie population also should be of no surprise, as there is more than enough anecdotal evidence out there to support that techies rank very high among the legions of Trekkies, not to mention that techie extraordinaire, Paul Allen, dedicated an entire section of the Experience Music Project Museum to the “Infinite Worlds of Science Fiction” (and another section to the first ever Hello Kitty Exhibit, but we’ll save that for another time). The annual throng of 80,000+ cosplayers who attend the (soon-to-be) four-day Emerald City ComicCon – featuring everything from superheroes and space adventurers to steampunk devotees – add an equally interesting dimension to these results. 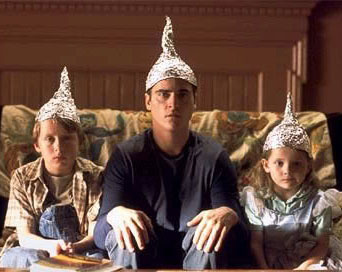 It also may help explain the market’s high ranking for Mystery/Suspense/Crime show viewing. As you know, content is a key driver in reaching and engaging nearly everyone these days. What they typically watch is yet another clue as to what to provide as a marketer (regardless of platform) and where to place media and promotional dollars if you want to get their attention. What’s more, exploring these channels can open doors to capturing otherwise elusive target prospects in new and creative ways. Equally telling and, depending on your perspective, a point of pride, is the market’s cellar position in nine of the 23 programming formats. Western Washington adults are far less likely to typically get their news and information from television news or talk shows, they apparently prefer their music live, their games interactive, and they steer away from the portrayal of life’s underbelly that makes up court TV and daytime soap operas. Finally, given the geekiness of the market, dating is daunting enough without subjecting oneself to the “reality” of it all. Not pointing any fingers, but Atlanta and Miami – really? Could it be that urbanicity skews the results? After all, top East coast markets generally are more compact than those in the West and the Seattle-Tacoma DMA comprises nearly all of Western Washington. The answer is, not really. The Seattle-Bellevue-Everett Metropolitan Division (King and Snohomish counties), which accounts for nearly 60% of the adult population and TV viewers in Western Washington, generally mirrors the DMA with one exception: While the Seattle-Tacoma DMA ranks 15th among the top 15 markets for typically watching late night talk shows (only 13% do), those at the local level are 21% more likely than the rest of the market to view this programming and account for seven in 10 of those viewers. Does age impact Seattle’s TV programming choices? Interestingly, the percentage of adults who typically seek out specific TV programming is fairly uniform across all age cohorts, with approximately 95% doing so. With only a couple exceptions, there also isn’t a lot of variance between the top five programming formats by age group, with Movies, Comedies, Sports, Documentaries, and Dramas topping the list in a total-viewer ranking. Not surprisingly, differences do surface when age cohorts are indexed against the total market adults. For the uninitiated, the index is a measurement of a group’s propensity to display a particular behavior. A score of 100 indicates “average” propensity, in this case, to have an affinity for a particular type of programming. Statistically, differences are significant (read: actionable) when the index is 120 or higher (it’s a defining trait) or 80 and lower (extreme aversion). To illustrate, Millennials are 73% more likely to typically seek out Music Video programming (index 173), and 53% less likely to seek out Local Evening News (index 47) when compared to total market adults. For the most part, favored programming, as well as aversions, tend to fit with life stages: kids programming tops the list among those of child-rearing ages and is the bottom for those who aren’t. No surprise, the market’s amazement with the supernatural does not extend to religion. Its ranking as the third least religious in the nation (behind #1 Portland and #2 Tampa), seems to hold true in viewing preferences… at least until one gets old enough to begin pondering life’s end! 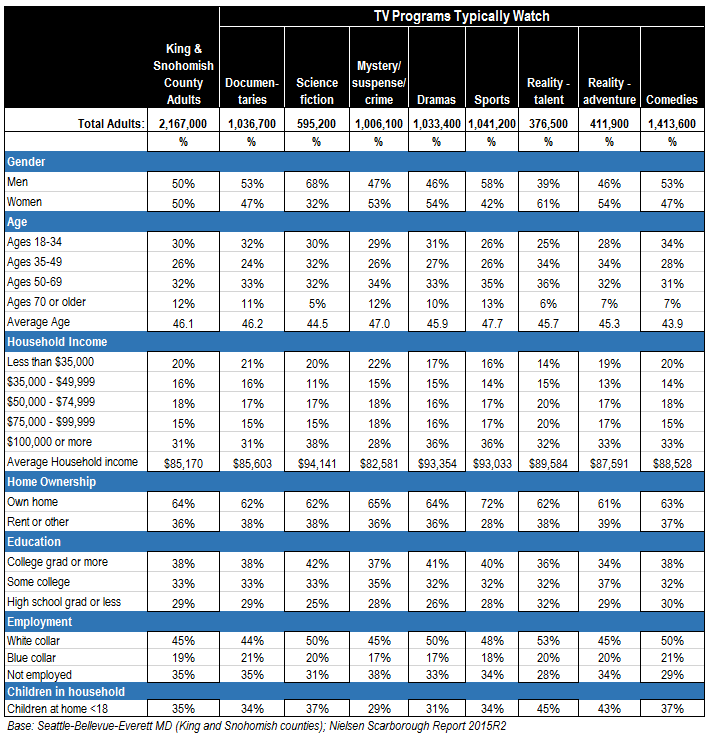 The table below focuses on the programming choices the market gravitates toward more than other markets and breaks out the demographic profiles at the pivotal King and Snohomish counties metropolitan market level. You will note that Science Fiction aficionados are predominantly male, younger and better educated than the general market and have plenty of discretionary income. Sports enthusiasts also are male, a bit older and upscale homeowners. You’ll find predominantly female audiences watch Reality – Talent shows. They are upscale and show the highest percentage of the profiled formats to work in white-collar jobs and have children in the household – a marketer’s dream! Also upscale, family-oriented and attracting both genders are Reality – Adventure shows. Dramas attracts the highest percentage of college graduates and, with average household incomes of $93,354 is second to Science Fiction viewers in earnings. Mystery/Suspense/Crime viewers draw the oldest audiences in this group, but ones with plenty of discretionary income. Comedies attract the youngest audiences, but they are upward bound and earn well above their age cohort. Nielsen’s PRIZM Premiere segmentation system adds yet another dimension to the audiences one attracts with these programming formats and, by extension, content topics, regardless of medium. 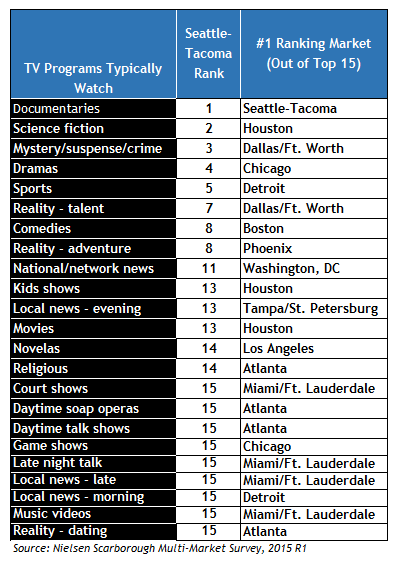 Listed below are the top indexing segments for the market and the Seattle adults who typically view the TV formats. (Click image to enlarge). For more information and descriptions beyond their titles, including demographics and media preferences, visit http://bit.ly/SeattleTVFormatSegments. Remember, these are audiences that the Seattle market delivers better than most other major markets. They are the fabric of our community and there are many ways to reach them through multiple media. If you would like help in doing that, let us know. Seat­tle Media Maven is open to your sug­ges­tions for topics/con­tent and always wel­comes tips, feed­back, ques­tions – what­ever is on your mind about the Seat­tle mar­ket and the media that serve it! Email us at seattlemediamaven@seattletimes.com.